University of Colorado Law School Professor Anna Spain Bradley addresses University of Houston Law Center students and faculty during a discussion in the Hendricks Heritage Room. 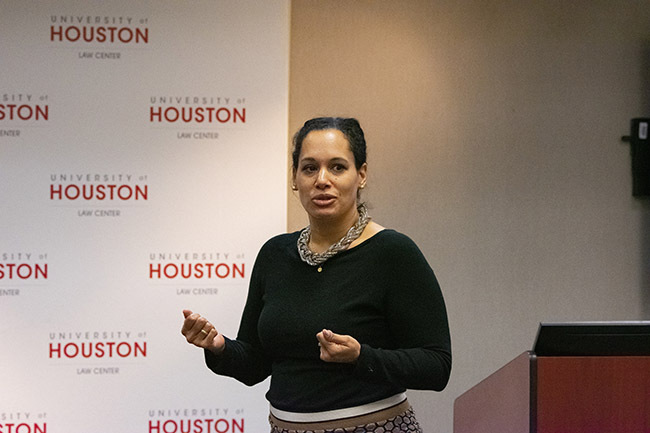 Jan. 30, 2019 - University of Colorado School of Law Associate Professor Anna Spain Bradley argued that international human rights law fails to adequately address racism as a violation of human rights during a presentation on Monday in the Hendricks Heritage Room at the University of Houston Law Center. Spain Bradley, who serves as the Assistant Vice Provost for Faculty Development and Diversity at Colorado Law, was the first of 10 participants in the Spring 2019 Distinguished Speaker Series. She drew from her upcoming article, "Human Rights Racism" which will be published in the Harvard Human Rights Journal this spring. "Racism, in all of its forms, is the under acknowledged human rights violation of our day," Spain Bradley said. "Despite human rights law that seeks to eliminate racial discrimination, racism remains a massive cause of discrimination, indignity, and lack of equality for millions of people in the world." Spain Bradley then discussed how international law currently doesn't name racism as a human rights violation, only racial discrimination. In her article, she identifies how "victims use the language of racism because it reflects their lived experience that the harms arise not only from the discriminatory act taken toward them but also from the hatred and racist animus behind such deplorable behavior." The article conceptualizes racism as a product of racial ideology and behavior that seeks to use the constructed identity of race to dehumanize entire groups of people. After World War II, the United Nations adopted the Universal Declaration of Human Rights, which affirms certain rights but does not provide for protections against racism. "Eleanor Roosevelt, alongside other important actors, spearheaded the creation of the first universal framework for global human rights," Spain said. "It enumerates the human rights every person is entitled to - civil rights, political rights, economic rights, social rights and cultural rights. But the Declaration does not address 'racism' or 'racial discrimination.'" Spain noted that the closest acknowledgment of racism as a human rights violation came in 1965 when nations around the world adopted the International Convention on the Elimination of All Forms of Racial Discrimination. "It was a landmark treaty because for the first time called for nothing more than the complete elimination of racial discrimination," she said. The series will continue at noon every Monday in the Hendricks Heritage Room until April 8, except for March 11 during spring break. The next speaker is Margaret Kwoka from the University of Denver's Sturm College of Law.